1. Mix all the marinade ingredients in a large bowl. 3. Cover the bowl with cling film and keep it in the fridge for 8 hours. 4. Remove the bowl from the fridge and discard the cling film. 6. Skewer the marinated chicken pieces. 7. Heat a griddle pan over medium flame. 8. Grill the chicken kebabs for 20 minutes, turning from time to time to cook evenly on all sides. 10. Serve with mint chutney and lemon wedges. 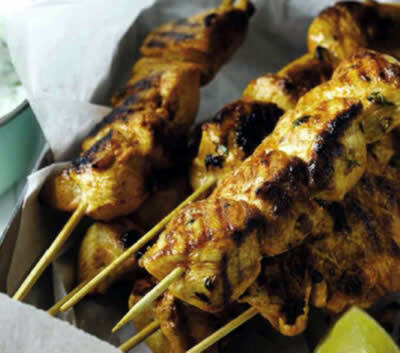 Feel free to comment or share your thoughts on this Chicken Kebabs with Paprika Recipe from Awesome Cuisine.